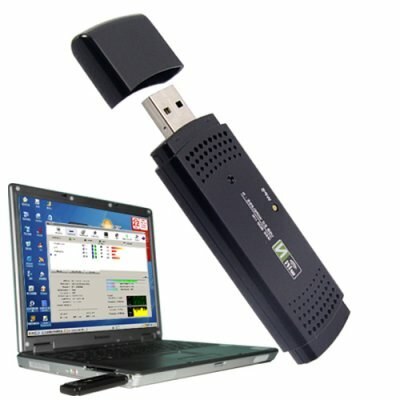 Successfully Added WiFi 802.11N USB Adapter - Hi-Speed Internet Connection to your Shopping Cart. Introducing the simplest and most convenient method of receiving the fasted wireless internet connection directly to your laptop. This WiFi USB adapter consists of an omi-directional integrated antenna, and use the 802.11N for optimum interned connection speed. This wireless USB dongle is a simple plug-and-play device with quick setup and installation. In addition, the CVSB-K42 comes with user friendly configuration and management software. This wireless 802.11N USB adapter is the next generation of WiFi internet connection speed, giving you 150-300Mbps! This WiFi USB adapter provides you with the connection speed necessary for media streaming and productivity improvement while working via the internet. Be able to connect to the internet wherever there is a hotspot or AP (access point), in ranges and speeds you have never seen before, with this new USB WiFi dongle. You can have the fastest available wireless internet connection without the need for buying a new computer or going through the hassle and expense of trying to upgrade your existing computer. Just install the intuitive software, plug the dongle into a USB port and you're ready to connect! This hot new item is proudly brought to you at a low factory direct wholesale price, straight from the leader in wholesale electronics, Chinavasion. WiFi internet adapter for IEEE 802.11N, IEEE 802.11G. There are no Linux drivers included with this model. We will try to develop 802.11N Linux products in the future so feel free to check back on our website later this year. Does installing the wireless 802.11N USB adapter, mean free internet? Only if your are at starbucks or other free WiFi hotspot with your notebook computer. Photos & Graphics By: T.L. .